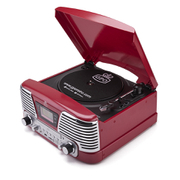 The GPO Memphis Turntable is a versatile 4-in-1 Music System with turntable, CD, MP3 and SD playback. 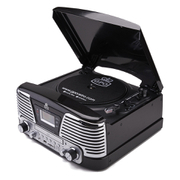 This retro full-size LP turntable features a belt drive system at 33/45/78 RPM. can be used to convert all your LPs and CDs to MP3, then save them to either SD card or USB pen drive. With a built-in amplifier and 2 x 1.5w RMS speakers, you can enjoy all your favourite music and activate bass boost for powerful sound. It also features an LCD display with blue back light that will display FM radio details and a 3.5mm jack plug to connect MP3 players or smartphones (connection lead included). - A.D.